The dismal prognosis of pancreatic cancer has not significantly changed over the last few decades. The incidence and mortality of this tumour entity are still almost identical, associated with a 5-year survival of <5%. Given the appalling outcome of the disease and the numerous regimens tested in clinical trials over recent years that have proved futile, there is an urgent need for novel therapeutic approaches to improve the situation. In this issue of the journal, the same group from Cambridge (UK) now provides further evidence for the prominent role of the stroma as the determinant of drug resistance and therefore the target for novel therapeutic strategies.4 The authors found hyaluronan (HA), a non-sulphated glycosaminoglycan, to be highly abundant in the extracellular matrix of both human and murine pancreatic cancer tissues (for a schematic overview on HA, see figure 1). Furthermore, they showed in a genetically engineered mouse model of pancreatic cancer that enzymatic depletion of HA by PEGPH20, a PEGylated human recombinant PH20 hyaluronidase, induced re-expansion of tumour blood vessels, most likely by reduction of interstitial fluid pressure (IFP) in the pancreatic tumour. Degradation of HA in xenografted tumours has previously been shown to reduce IFP and enhance the activity of chemotherapeutic agents.5 Indeed, in the study presented in this issue, administration of PEGPH20 before gemcitabine led to increased concentration of the active gemcitabine metabolite in the tumour, which was elegantly shown by directly quantitating intratumoral concentrations of gemcitabine metabolites using a highly sensitive LC-MS/MS approach.6 Following enhanced drug delivery, combination therapy of the endogenous tumours with PEGPH20 and gemcitabine led to significantly diminished tumour growth and prolonged survival in mice. 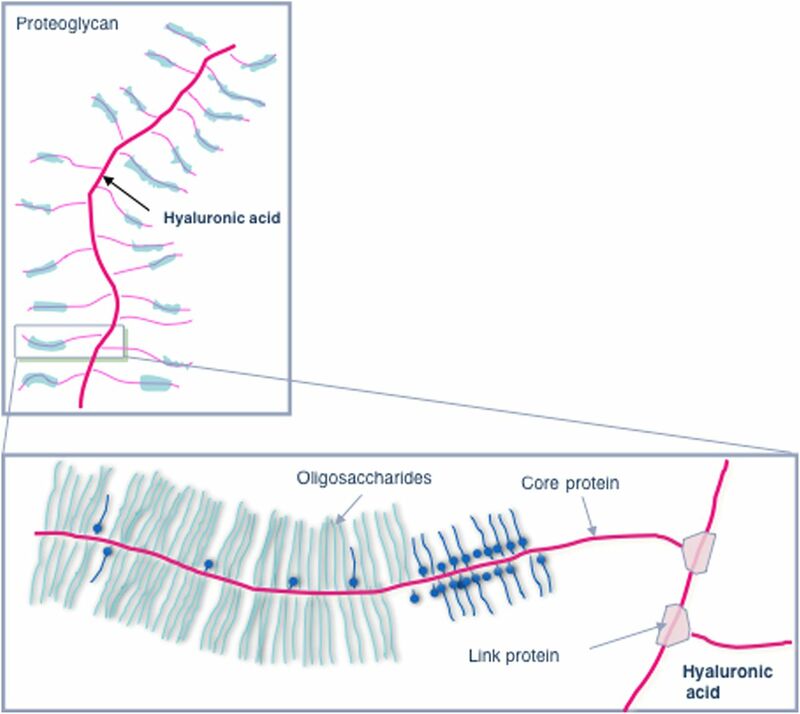 Schematic representation of hyaluronic acid as a constitutive component of proteoglycans in the extracellular matrix of pancreatic cancer. In addition to its effect on the stromal HA content, PEGPH20 promoted a tumour-specific increase in macromolecular permeability by inducing fenestrations and interendothelial junctional gaps in the endothelia of the tumour vessels (for a schematic representation of the proposed mechanism, see figure 2). This is one of the first reports that tumour vessel permeability may limit response to cytotoxic treatment and can be modulated in primary tumours. The molecular basis of this intriguing observation remains to be fully elucidated, but it is in line with previous reports demonstrating a role for HA in increasing endothelial barrier integrity, possibly through CD44-dependent reorganisation of the endothelial actin cytoskeleton.7 Interestingly, the ultrastructural phenotype described for the vascular endothelial cells after treatment with PEGPH20 is very similar to that associated with vascular endothelial growth factor (VEGF)-induced hyperpermeability.8 Vice versa, the absence of this phenotype in untreated endogenous pancreatic cancers from mice with pancreas-specific expression of mutated K-ras and inactivated p53 (KPC mice) may explain the failure of anti-VEGF agents in pancreatic cancer. 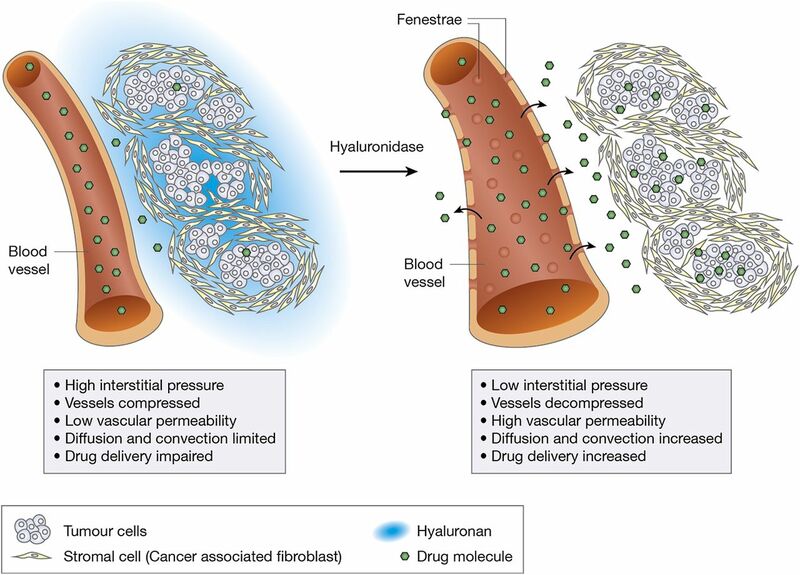 Schematic representation of the effects of hyaluronidase on the tumour vasculature and interstitial pressure in pancreatic cancer. Although the end points demonstrating significantly increased survival after combination therapy are concordant in the two papers, the mechanistic models for PEGPH20 action provided in the two studies and the experimental set-ups are somewhat different. While Jacobetz and coauthors only used KPC mice with advanced pancreatic tumours and a volume of 270±100 mm3, corresponding to the situation found in the majority of patients with pancreatic cancer, Provenzano et al used smaller tumours of wider size range (from 2 mm to 5 mm diameter), corresponding to more variable, earlier stages of the disease. Furthermore, the application protocols for PEGPH20 and gemcitabine were different; most significantly, the group in Seattle used higher doses of PEGPH20. However, even when using these higher doses of PEGPH20, the authors could not detect significant toxicities or morphological alterations in healthy non-target organs. An interesting additional observation of Provenzano et al was the reduction in the number of metastases in mice treated with both gemcitabine and PEGPH20 compared with those treated with gemcitabine alone. PEGPH20 was also effective in reducing the HA content of the metastases, which was associated with increased apoptosis and reduced proliferation in these lesions. It is reassuring to note that re-establishing tumour perfusion and inducing fenestrations in the endothelia of the tumours through depletion of HA does not lead to increased metastasis formation. This is particularly interesting in the light of other recent reports in different tumour models that VEGF-based antiangiogenic strategies may actually lead to enhanced metastasis formation due to multiple mechanisms of adaptation.10 It can be speculated that the scarce vasculature and increased IFP seen in pancreatic cancer represent a prometastatic microenvironment that can revert to a less hypoxic and less metastatic one after depletion of HA and other components of the extracellular matrix. What can we learn from the study of Jacobetz et al in this issue and the parallel study by Provenzano et al? Clearly, the importance of the tumour microenvironment as therapeutic target in pancreatic cancer has been substantially corroborated. Although cell autonomous effects that render tumour cells more susceptible to cytotoxic agents cannot be ruled out completely for both the anti-hedgehog strategy reported by Olive et al in 20093 and the current HA-targeting approaches, the accumulating evidence obtained by different independent strategies is compelling. Depletion of HA and its impact on vascular re-expansion, increased tumour vessel permeability by ultrastructural changes in the endothelium, and finally on IFP suggests that this approach is suitable as an adjunct to different agents of larger hydrodynamic size such as monoclonal antibodies and albumin conjugates currently in clinical testing. Based on the preclinical data on anti-HA strategies in appropriate mouse models obtained by both studies, clinical trials are ongoing to prove the effect of depleting HA in patients with pancreatic cancer (http://www.clinicaltrials.gov). It remains to be demonstrated which strategy to target stromal response and re-expand the vasculature in pancreatic cancer is most efficient. Removal of extracellular stromal components such as HA represents a good approach in this context, as shown by both studies. In addition, targeting stromal signalling pathways such as sonic hedgehog signalling has also shown promising preclinical effects, and the results of ongoing clinical trials are eagerly awaited. Moreover, other cellular and acellular stromal components should be explored as further potential targets, among them pancreatic stellate cells and activated stromal fibroblasts as major sources of the pancreatic stroma, as well as inflammatory cells, such as tumour-associated macrophages and other immune cells,11 ,12 that are also involved in modulating tumour vasculature and matrix deposition.13 Furthermore, stroma-related signalling pathways active in these cell types, such as the transforming growth factor β pathway, are promising candidates. It remains to be demonstrated whether these innovative strategies targeting the stroma are finally able to make a difference after the long series of futile therapeutic trials and can be translated into clinical benefit for patients with pancreatic cancer.
. Stromal biology and therapy in pancreatic cancer. Gut 2010;60:861–8.
. CD40 agonists alter tumor stroma and show efficacy against pancreatic carcinoma in mice and humans. Science 2011;331:1612–16.
. Suppression of antitumor immunity by stromal cells expressing fibroblast activation protein-alpha. Science 2010;330:827–30.
. Role of tumour-associated macrophages in cancer-related inflammation. Exp Oncol 2010;32:153–8.